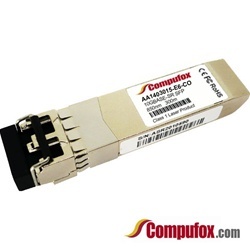 AA1403015-E6 - 100% Avaya Compatible - Lowest Prices! Avaya Compatible 1-port 10GBASE-SR Small Form Factor Pluggable Plus (SFP+) 10 Gigabit Ethernet Transceiver, connector type: LC. Supports (50um) for interconnects up to 300m. Core 62.5um fiber also supported.